Like many places in Greece, Lefkada combines the beauty of the nature with rich history and cultural heritage. Even though the island suffered great earthquakes which destroyed important archaeological sites, there are still plenty to see in order to travel back in the times of ancient Greece, the Byzantine and the rest of the civilizations that ruled Lefkada. If you are a culture lover, visit the fortress of Agia Mavra in the northeast of the city and the ruins of the ancient city of Nirikos. 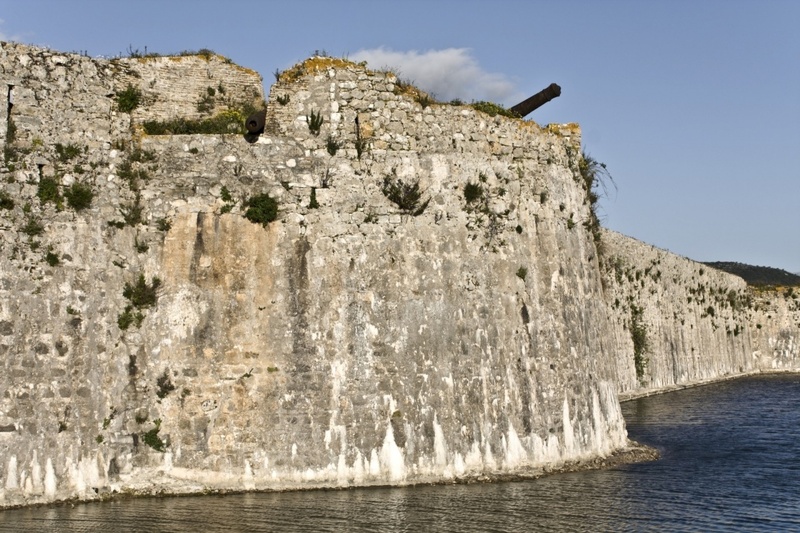 The fortress was built by the Count of Orsini who got Lefkada as a gift from the Franks. It is an excellent example of fortressing architecture, it has been renovated and is well-preserved. A lot of cultural events take place in the fortress during the summer. Its close proximity to the Town gives you a great opportunity to join one of these events while you are on holidays. Nirikos was one of the capitals of Lefkada and was built amphitheatrically on the cliffs of the northeastern side of the island. There are ruins of a castle which protected the city from raids. It is said that the city was abandoned in around 1300. In Lefkada Town you could visit the museums of the island. The most interesting ones are the archaeological museum and the ecclesiastical museum which is housed in the convent of Faneromeni, the religious centre of the island. If you don’t like museums, but you prefer outdoor sights, do visit the remains of the cyclopean walls. 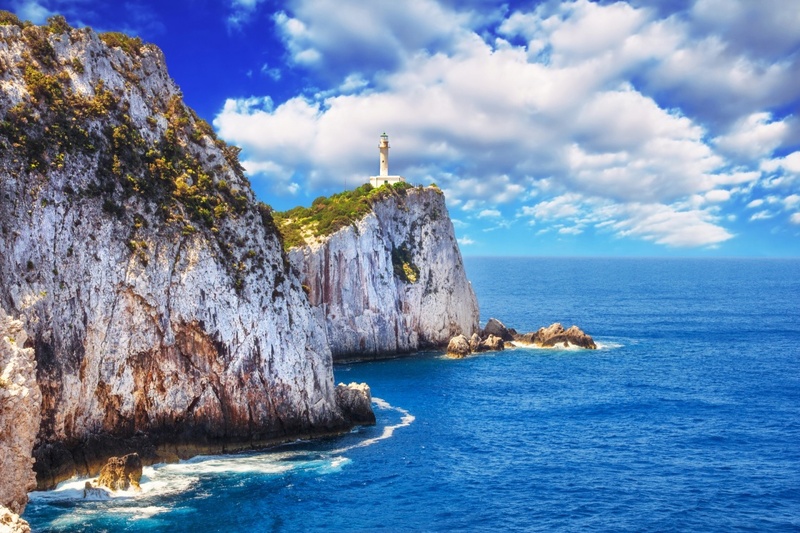 The legend has it that Lefkada is the real Ithaca Homer described in his poems. The island has rich literary tradition since some of the most important Greek poets, like Valaoritis and Sikelianos, were from this area. The municipality has made a park called the Gardens of Poets in the centre of Lefkada Town in honour of its talented artists. For those of you who are into alternative types of holidays, like ecotourism, in Lefkada you will have the chance to admire marvels of nature and unique landmarks. Nature has been very generous to Lefkada and even though it is an island it isn’t dry at all. Instead, there is enough water to convert the island into a green paradise with marvelous waterfalls in the gorge of Dimossari. The area of Dimossari was named after the windmills that used to be there and belonged to the state, “demos” in Greek. 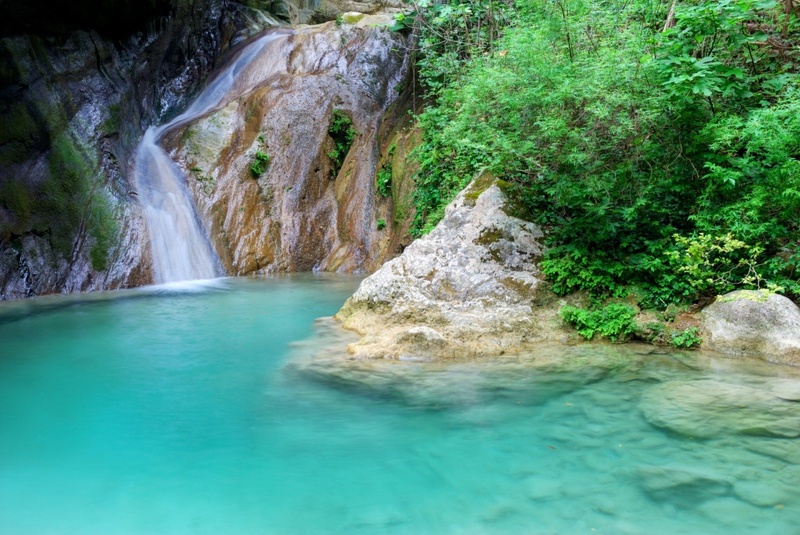 The waterfalls form lovely small ponds surrounded by rocks and plane trees. The water is crystal clear and extremely refreshing. Have a swim under the waterfalls and feel as if you were in a tropical jungle. Writing about tropical places, the gulf of Sivota resembles so much to the Caribbean that the Greek Ministry of Tourism have used it for their advertising campaign! The gulf is ideal for sailing since there is only a small exit to the Ionian Sea and the water is almost always calm. That is why many sailing boats from all over the world come to the gulf of Sivota to moor. For something out of the ordinary, visit the village of Voltoi. It is located on the slope of the mountain and it has nothing to do with anything else on the island. Here, there are no houses but stone huts built amphitheatrically. They are consisted merely of a room for the farmers, a storage room for the crop and a room for the animals. Last but not least, Lefkata Cape or Cavo Dukato is surrounded by stories and myths to add mystery to your holidays. It is the largest and most southern cape on the island and it has been known since Homer. It is said that human sacrifices were taking place here or that desperate lovers came to the cape to commit suicide after they had been rejected. The legend has it that the famous poetess of the ancient times, Sapfo was the first who jumped off the cliff. There used to be a temple of the ancient god Apollo. In its place, a lighthouse has been built from the ruins of the temple.